The Colors of the Year Have Finally Made their Appearance | Grand Central Magazine | Your Campus. Your Story. Feel like you’ve been seeing pastel pink and blue everywhere? You’re not going crazy – they’re the colors of the year. Each year, Pantone – the leading company behind color systems for fashion and painting – chooses a color of the year that experts believe will be seen on the runway and in homes. For the first time ever, Pantone introduced two soft, complementary colors – Rose Quartz and Serenity. Rose Quartz and Serenity fall between rose and tranquil blue, the two colors blend together to the eye to create a warm sensation. The colors create a calm, peaceful and soothing look for the target marketers (aka, you and me). These colors unify the gender blur, which has always been a huge problem in fashion. When children are born, they’re instantly put into a category with boys wearing blue, and girls wearing pink. 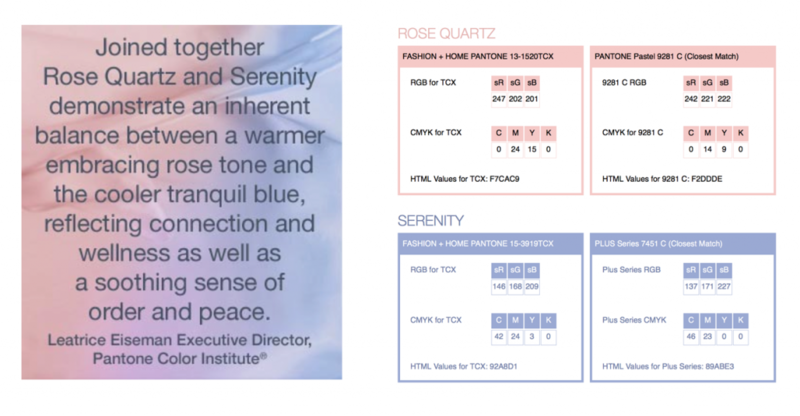 Rose Quartz and Serenity are both ambiguous and complement any body shape, male or female. Hopefully society will react well to this new and improved way of accepting equality for both men and women to wear whatever color they feel comfortable in. Pantone suggests wearing these colors with shades and tints of blue, grey and orange. Previous colors of the year include Marsala, Radiant Orchard and Emerald. Separator image Posted in Style, Style, Trend and Beauty and tagged with 2016, Anne Langan, arika french, Color of the year, Rose Quartz, Serenity, Style.